L'excellent raw data qu'on ne présente plus sur ETR ne cesse de s'améliorer au fil des mises à jour et cette fois, il se pourrait que ce soit la bonne pour les problèmes de performance ! Le jeu vient d'être mis à jour en version 0.5, qui inclut une flopée de nouveautés comme des améliorations de la narration, du contenu, la possibilité de mettre le jeu en pause en solo des améliorations de gameplay... Mais la nouveauté majeure est probablement le passage à l'Unreal Engine 4.13.2 et l'amélioration des performances, qui rendent le jeu bien, bien plus fluide ! De plus, les paramètres graphiques seront réinitialisés après avoir lancé la mise à jour et le jeu réglera automatiquement les graphismes selon votre machine, ce qui permettra de donner un indice sur quel paramètre se caler. La valeur affichée du réglage de superampling a aussi été modifiée (Steam considère 1.4 comme la valeur native), donc ne vous inquiétez pas si vous ne pouvez pas atteindre la même valeur qu'avant sans baisse de performance. Si vous cherchez des gens avec qui jouer, nous venons de lancer un Discord, qui devra bientôt être intégré au site. N'hésitez pas donc à venir dessus pour trouver un partenaire sur Raw Data ou un autre jeu ! Storytelling - Narrative VO and environmental storytelling elements added to all existing missions. Post-Mission - Narrative VO added to Showroom post-mission completion. Soundtrack - New music soundtrack added to Skybound, Vapor Exploit, Nuke Fusion, and Thundershock missions. Music Cues - New music cues implemented for player death, fail, and win states. Visuals - Eden Corp Orbital Connectors, Orbital Rings, and updated Skybox added to Skybound, Vapor Exploit, Thundershock, and Showroom vistas. Boss Unlocked - Boss is now unlocked by default. Boss’s ability upgrades will still need to be unlocked. Vapor Exploit Dropships - In the Vapor Exploit mission, enemies will now spawn randomly throughout the map from incoming Eden Corp Security Deployment Dropships. Extermination Switch Puzzle - In the Extermination mission, the Switch Puzzle now scales with difficulty and multiplayer. Switch colors can also be adjusted to support visibility for colorblind players. Sound Effects - We’re in the process of updating many of the game’s legacy sound effects; quite a few have already been replaced, and there’s more to come! Improved Hand Positioning - Greatly improved the accuracy of the rendered position of player’s virtual hands and held objects in relation to their real-life hands and controllers. Improved Teleshift Targeting - Teleshift beam will now arc towards the actual target location to clarify where players will end up when the straight beam does not actually point at the target location (such as towards max teleport location or at a wall). Preferences Tab - Players can now set the following options in the Preferences panel accessed within the Main Menu and In-Game Menu: Show/Hide Forearms, Show/Hide Playspace, Enable/Disable Late Update (experimental feature to improve hand tracking latency and performance that is disabled by default). Unreal Engine - Raw Data is now built on Unreal Engine 4.13.2 with Survios customizations. Charged Shot - Charged Shot no longer pierces the environment, and its maximum collision radius has been reduced from 30 to 25. Charged Shot collision now ramps up over time. Time Warp - Time Warp duration reduced to 6 seconds. Flash Blade - Melee damage doubled. Katana Throw - Katana Throw return damaged increased by 6x so it now deals the same damage throughout the entire flight. Levitation Smash - Levitation Smash damage increased 6x. Cooldown increased by 10 seconds. Reflection Counter - Reflection Counter is now a base ability; you can now reflect projectiles without needing to forcibly strike them. The collision radius has been reduced, so it will require more precise positioning of the Flash Blade to reflect projectiles. Dominator Shotgun - Spread pattern of Dominator Shotgun has been decreased and damage falloff reduced; together, these increase its effective combat range. Plasma Grenade - Plasma Grenade max damage reduced and damage falloff greatly reduced. Plasma Grenade is now an effective AoE weapon, rather than a single target destroyer. Hornet Drone - Hornet Drone’s collision sphere size increased. Enemy Spawn - Global enemy spawn tuning. Enemy Animations - General improvements to enemies’ physical animation. Ragdolls during death are now blended with animation to create a more realistic effect. Nuke Fusion - Overall difficulty reduced and Fusion Chamber capture mechanic simplified. When captured, a Mega Dynamo will drop in as before, but Eden forces no longer retain control of the Fusion chamber after the phase ends. Enemies should no longer teleshift into the Fusion Chambers after it has been captured. Instead, enemies will need to recapture the Fusion Chamber to call in more Mega Dynamos. Nanos - Dealing damage no longer awards nanos--only kills do. Physics - Mask physics stalls during heavy scenes by moving calculations to run alongside physics in parallel where possible. AI Capsules - Improvements to AI capsule overlaps. Turrets - Improvements to turrets. Crusader Pistol - Improved spawning hit of Crusader Pistol’s projectiles. Net Update - Reduced Net update frequency for Actors across the board. This will decrease CPU load on the host. Animation - General improvements to AI animation performance. Dynamic Assets - Optimized memory footprint by dynamically loading assets only when needed and decreasing resolution of unnecessarily high resolution textures. Cubemap Reflections - Lowered graphics settings use a predetermined cubemap rather than cubemap reflections to avoid a minimal visual fidelity cost. Host Crash - Fixed a bug that could cause the host to crash when a client player dies. Shotgun Physics - Fixed the physics on Boss’s Dominator Shotgun behaving erratically after being thrown. Server List - Fixed the server list browser not updating and displaying results. Also fixed the auto-search checkbox not displaying its state properly. Elevator Pause - Fixed long pause before elevator descent in Dark Source and Extermination missions. Lost “Sticky” Pistol - Fixed an issue where player randomly loses Crusader Pistol while playing on “Sticky” control scheme. Sticky Weapon Drop - Fixed an issue where players could sometimes drop their weapon despite being in Sticky mode. VIP Bots - Fixed an issue where VIP bots were unable to capture the Fusion Chamber in Nuke Fusion mission. Playspace - Fixed an issue where players standing outside their playspace on launch would end up in an unresponsive state. Bishop Charging VFX - Fixed an issue where clients playing Bishop could sometimes break the charging VFX on Charged Shot. Hovering Enemies - Fixed an issue where enemy bots could sometimes hover in the air at strange angles. Showroom Sunken Floor - Fixed an issue where players were sometimes sunken into the floor when returning to the Showroom. Showroom Freeze Fix - Fixed an issue where game could lock up and freeze in the Showroom. Client Player Spawn - Fixed client player spawning inside the elevator when going back up from a mission into Showroom. Host Start - Fixed a bug that could resort in the host not being able to start a mission after playing a mission with a client and returning back to Showroom. Dark Source Stuck Player - Fixed an issue where players can become stuck and unable to Teleshift in spawn halls on Dark Source mission after being knocked back from an explosion. Extermination Lasers - Fixed an issue where lasers would not properly display on client in Extermination mission. Extermination Freeze - Fixed an issue where the game could lock up and freeze in Extermination mission. Extractor Tooltip - Fixed an issue with the Extractor tooltip not displaying properly on some maps. Scroll - Fixed an issue where Developer Notes would not scroll. Private Listing - Fixed an issue that caused some private games to be listed publicly. Lighting - Fixed an issue that caused some lighting to display incorrectly when the player turned their head. Host Game - Fix for not being able to host a game after playing the defense placement training session due to a dummy player appearing in the player list. Saija Ability Meter - Fixed Saija’s ability meter icon getting stuck on Shuriken Stream or Gravity Thrust. Rack Up Scoreboard - Fixed rack up scoreboard appearing in the Showroom when a client joins a host who had the scoreboard show up earlier. Loading Screen - Loading screen is missing and some loads may take longer than normal as asynchronous loading has been disabled. This will be fixed in a future update. Enemy Physics - Enemy bodies sometimes behave erratically during hit reactions, especially when impacting with other geometry. This will be addressed in a future update. AI Elevation - Enemies will sometimes attempt to unsuccessfully target players on higher elevation. This will be addressed in a future update. Stuck Heavy Rocket Bot - Heavy rocket bots will sometimes stop walking. Disappearing Heavy Bots - Heavy bots sometimes disappear when killed. Ninja Bot Targeting - Ninja bots sometimes improperly target the Data Core. Turret Rotation - Turret’s rotation is jerky on client machines. Ammo Indicator - Boss’s ammo indicator animation can become unreliable. Floating Turrets - Placing Turrets or the Shield Station on an elevator will cause them to float in the air. Bluetooth Headsets - When playing with a Bluetooth headset that has a built-in mic, audio may not be routed through the headset. 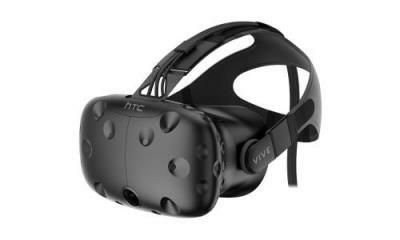 Current workarounds include disabling/uninstalling headset so audio is routed to HMD, or changing Steam VR settings to force audio to be routed to headset. 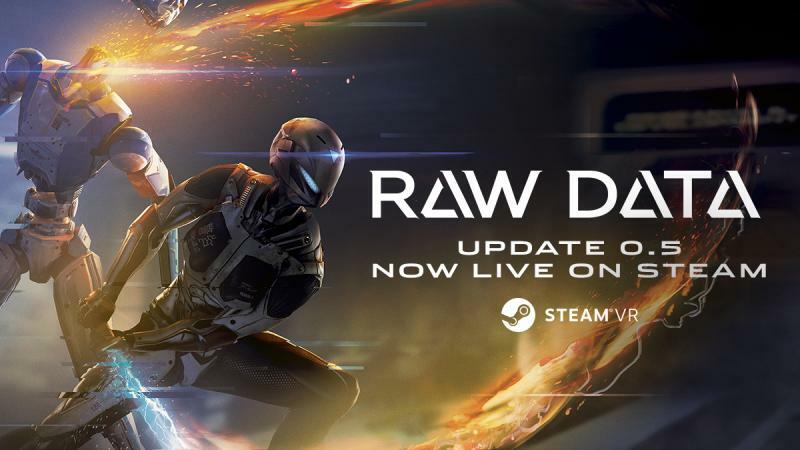 Raw Data est un FPS roomscale futuriste se jouant seul ou en coopération, qui mélange les armes blanches avec les armes de tir, en proposant un arsenal composé d'arcs, sabres laser et pistolets.